The sin of the golden calf is widely regarded as one of the most disgraceful moments in Jewish history. In Exodus, chapters 31-32, theTorah tells how three months after leaving Egypt, and a mere 40 days after receiving the Torah at Mount Sinai, the Jewish people created an idol and worshipped it. Having miscalculated the date of Moses’ promised return from the mountain, the Jewish people thought their leader had died. They decided to replace him, and with the help of Aaron, formed a golden calf and worshipped it. On the 15th day of the Hebrew month of Nissan, the Jewish people left Egypt and began traveling through the desert. After 49 days of travel, on the 50th day, the sixth (or the seventh1) of Sivan, G‑d gave them the Torah. Standing at the foot of Mount Sinai, they witnessed G‑d’s glory descend upon the mountain, and they heard the Ten Commandments. The next day, G‑d commanded Moses to ascend the mountain for 40 days, where He would teach him all the laws and present him with the tablets on which the Ten Commandments were carved.2 Moses took leave of his people, promising to return in 40 days. When Moses told the people 40 days, he meant 40 full days—nights and days. And since Moses left in the morning, that first day was not included in the count. However, the Jews miscalculated, and expected Moses to return on the 16th of Tammuz. In vain the Jews waited for Moses on the 16th, and when he didn’t show, they began to worry. The biblical commentator Rashi3describes how Satan made the sky grow dark and caused a feeling of gloominess to descend upon the camp, further unnerving the people. As this was happening, the erev rav (“mixed multitude”)—a ragtag group of Egyptian outcasts4 who had tagged along with the Jews when they left Egypt, and who were insincere in their commitment to G‑d—convinced the people that Moses was dead and that they needed a new leader. Terrified, the Jewish people gathered around Aaron, Moses’ brother, and demanded that he make them a new leader. (The commentators note that, at this point, the people only wanted a new leader in place of Moses, not a new G‑d.5) Aaron told them to go home and collect their wives’ jewelry and bring it back to him. Crazed, the men ripped off their own jewelry and threw it into a fire. And out of the fire a golden calf emerged. The Talmud states that when Moses broke the tablets, G‑d agreed with his action and praised him.22 But this seems strange: even if Moses’ smashing of the tablets was justified, why was it praiseworthy? This is made even stranger when we take a look at the end of the Torah. The Torah concludes with a description of Moses’ greatness, and the final words are, “All the great wonders that he performed before the eyes of the Jewish people.” Rashi, concluding his commentary on the entire Torah writes: “This ‘wonder’ that he performed before the eyes of the people was the smashing of the tablets, and G‑d agreed with him and praised him.” Astonishing! The entire Torah ends with the statement that Moses’ breaking of the tablets, a result of perhaps the gravest sin ever committed, was praiseworthy. Why? Moses ground the golden calf into a powder, mixed it with water and gave it to the worshippers to drink, killing them. He then commanded the tribe of Levi, who had remained faithful to him, to further seek out any worshippers and annihilate them. G‑d brought a plague on the Jews, killing thousands more. Moses returned to the mountain two more times for 40 days each, finally descending on Yom Kippur bearing the second set of tablets and having secured G‑d’s forgiveness. The episode of the golden calf elicits many fundamental questions. How could the Jews commit such a terrible sin a mere 40 days after receiving the Torah? The giving of the Torah was the most spiritually uplifting moment in our history, and the Jews were on an incredibly high level. How did they fall so fast, transgressing the first two of the Ten Commandments? Additionally, what exactly was the point of the golden calf? Did the Jews really think that an inanimate statue could replace Moses, pray to G‑d on their behalf and lead them through the desert? If they needed a leader, why not appoint Aaron, Joshua, or one of the elders? Why did they immediately fashion an idol? In fact, the Talmud states that at that point in time, the Jewish people were entirely righteous, insusceptible to sin.26 The sin of the golden calf was a “decree of the King so as to provide an opening for penitents.” G‑d guided them into sinning so that a precedent would be set for future penitents: repentance would always be accepted no matter how grave the sin. For if the terrible sin of the golden calf was forgiven, then all sins could be forgiven. 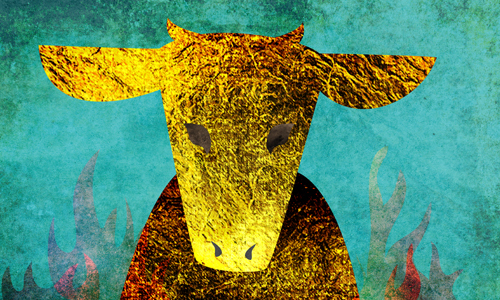 Another explanation, provided by the Rebbe, re-examines the motives of the Jews who created the calf, and sheds much-needed light on the whole story. As we learn in the chassidic teachings, the purpose of the creation of the world is that we make a dwelling place for G‑d through Torah and mitzvahs. When we learn Torah and perform mitzvahs, we draw G‑dliness down into the world and permeate the physical with spirituality. Before the giving of the Torah, this was unachievable, because “the heavens belonged to G‑d and the earth to man.”28 When G‑d descended from heaven onto Mount Sinai, He empowered us to bridge the gap. From then on, G‑dliness and physicality are able to unite, and thus when we take a physical object and perform a mitzvahwith it, we infuse the physicality with G‑dliness. Initially, the Jews had no intention of sinning. However, their choosing to connect with G‑d from the self, not in the way that was mandated by G‑d, started them on a downward spiral. Once they began to act in their own interests, their interests became more important than G‑d’s, ultimately leading some to indulge completely in their own desires and commit terrible sins. 1.There is an opinion among the sages that the Torah was given on the seventh of Sivan. However the accepted opinion is that it was given on the sixth. 5.Nachmanides on Exodus 32:2. See also Likkutei Sichot, vol. 11, pp. 143-145, where Rashi is shown to hold this view. 14.Additionally, from a halachic perspective, Aaron was exempt and and did not commit the sin of forming an idol. There is a halachic principle that “one can not render someone else’s property forbidden for usage.” E.g. : Wine poured for idolatry becomes forbidden for personal use. However, if one pours someone else’s wine for idol worship, the wine remains permissible. This is because the Torah does not assist one in harming his fellow. Aaron was careful never to personally acquire the gold, telling the Jews, “bring it to me,” and not “give it to me.” Since the gold was never his, he did not have the power to render it an idol, forbidden for usage. And since Aaron never personally worshipped the calf, he was not liable for its construction, or for worshipping it. See Likutei Sichot, vol. 11, pp. 149-153. However, the Rebbe does not provide an answer for the question of Aaron being liable for committing the sin of “lifnei iveir,” placing a stumbling block before the blind. 19.Shabbat 87a, Yevamot 62a, Rashi ad loc. 23.Malachi 3:22. Shemot Rabbah 30:4. 24.Likutei Sichot, vol. 34, pp. 217-224. 26.Avodah Zarah 4b, Rashi ad loc. 27.Likkutei Sichot, vol. 15, pp. 408-416. 29.See Nachmanides beginning of Parshat Terumah. 30.Likutei Sichot, vol. 24, pp. 5-8; vol. 26, pp. 248-253. As taken from, http://www.chabad.org/parshah/article_cdo/aid/3613047/jewish/What-Was-the-Golden-Calf.htm on March 14, 2017.